Please note that all RDA groups (and most riding schools) have to have a weight limit to protect horses and helpers. The Cambs College weight limit is relatively high thanks to our horses being bigger than the average RDA horse, but rider weight is a major equine welfare issue so has to be strictly managed. No experience is needed! Some new RDA riders have ridden before but many haven't. If you or someone you care for would like to join the group then please get in touch with either Gillian Newsum (Group Chairman) or Mavis Bishop (Group Secretary) - contact details are available on the Contact page. They will help you to arrange a time to come and watch the group ride and to give it a go! There is an upper limit on the number of riders in the group but anyone interested is encouraged to get in touch at any time as there are often spaces, and people can always be added to a waiting list. Please read on for further important information for new riders. Please arrive as close to 4pm as possible at the College of West Anglia (see the Contact page for a map). When you arrive, park in the main Visitor Car Park. 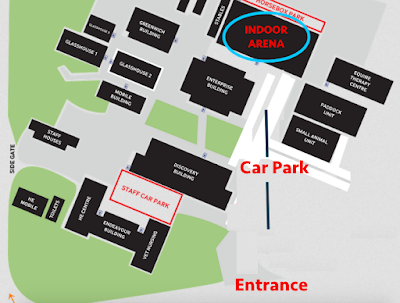 Blue Badge spaces are available but the arena we use is at the other end of the car park, so you may prefer to park at that end for a shorter route. Head towards the big grey building marked 'Indoor Arena' and go up the little ramp to the brown wooden door - we will be inside! There is space for riders, carers and parents to wait and watch but please be aware that there is no heating and it gets very chilly in the winter! As a general rule, you won't need to buy lots of specialist equipment to start riding. We can lend some equipment - please see below to find out more. Suitable trousers - jodhpurs are ideal but tracksuit trousers or thick leggings will do. Jeans are not suitable because they rub, nor are shorts. Boots - we have some pairs of boots available to borrow but there's a limited array of sizes. If you can bring wellies or walking boots these may be suitable, especially as we have specialist stirrups which can be used to make footwear safer. Helmet - unless you already have one, it is not worth buying a helmet before you come to try riding. We have an assortment of helmets that riders can use which all correspond to the latest safety standards. If you choose to buy your own helmet later on you will have to buy one which meets these specific safety standards and we can advise on this. Other than that please just dress sensibly and comfortably! Bear in mind that, although we ride in an indoor arena, it can get extremely cold in the winter both for riders and for anyone watching. Gloves are recommended but they must have good grip - if necessary these can usually be borrowed. If you do decide to join the group we can give advice on how best to source items of equipment. There are plenty of local retailers selling good quality but affordable equipment. We don't normally look this smart! There is a form that must be filled in by you and/or a carer before you can ride. The form mostly asks for basic personal information (name, date of birth, address, emergency contact, etc.) and for some information on your disability. Usually people can have a go as soon as the forms are completed, and we will make sure you're kitted out with boots and a helmet that fit well first. The group will always ensure that you are as safe as possible. Riders taking part for the first time will generally be led throughout their first session even if they have ridden elsewhere before. It is also possible to have 'sidewalkers' who can help you to feel secure, understand instructions and get the most out of your session. 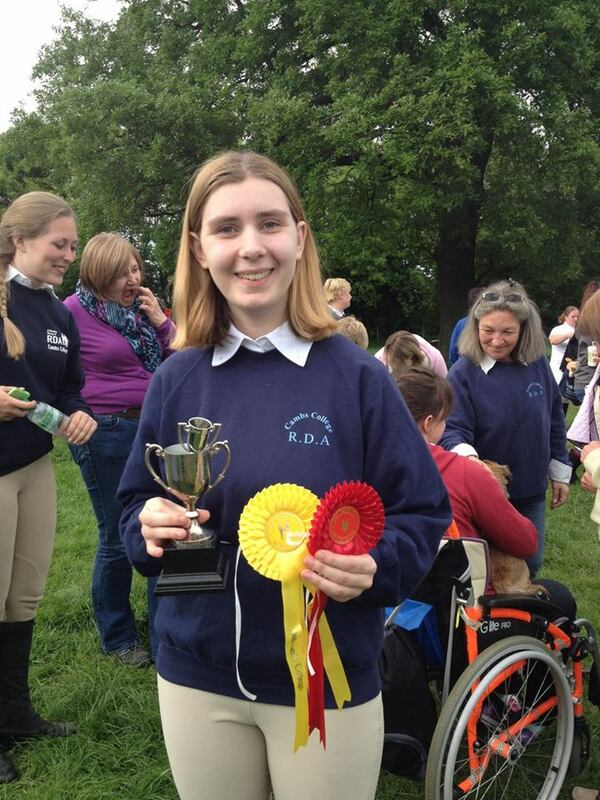 You will be riding at the same time as other RDA riders and will take part in the same activities where practical. You will probably ride for no longer than around 30 minutes at first, but if this is too long then you are welcome to stop or rest at any time. Learning to ride is tricky! There's a lot to learn physically but there are also lots of new words and expressions which can be hard to learn. Helpers are there to help you to understand and to feel confident so don't worry about asking silly questions - there aren't any - so just come and have fun!